According to the Dxomark.com, the Sigma 35mm F1.4 DG HSM A lens is your best choice. Zeiss Distagon T 35mm f/1.4 ZF2 and Zeiss Distagon T 35mm f/2 ZF2 are great lenses for Nikon D750, but they are more expensive than Sigma 35mm F1.4 DG HSM A and Samyang 35mm F1.4 AS UMC. The brand new Sigma 24/20mm F1.4 DG HSM | Art lens is another best choice and it is now in stock & shipping. In 2017, Sigma even released the ultra-wide fast Sigma 14mm F1.8 DG HSM | Art lens (Amazon/ B&H/ Adorama) ! 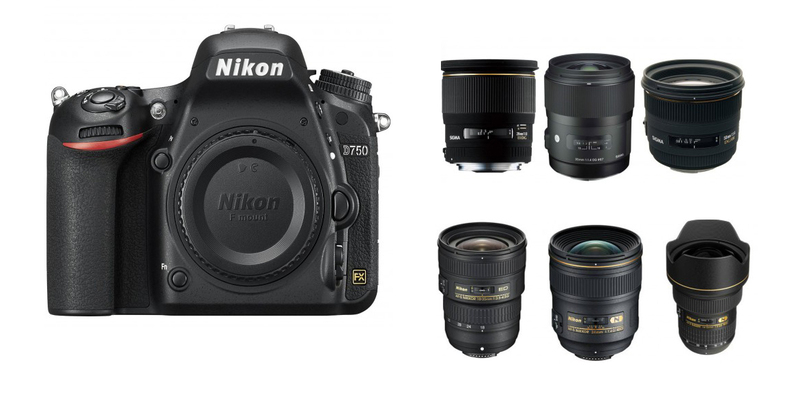 From the list, It is clear that Nikon’s 14-24mm f/2.8G ED is the best wide-angle zoom lens for Nikon D750. The new Tamron SP 15-30mm f/2.8 Di USD Lens and the new released Sigma 24-35mm f/2 DG HSM Art Lens are another best choice. The new released Sigma 12-24mm f/4 DG HSM Art (Amazon/ B&H/ Adorama/ eBay) is another best zoom for around $1,500.